It’s here! It’s here! The last day of school is finally here!! Here in my neck of the woods summer vacation doesn’t actually start until the 28th but we are pulling the monkeys a couple of days early. Change is subtle sometimes that we miss it so this is a perfect place to end the school year. I wish I had done this with my oldest, she changed so much throughout the years it would have been fun to look back on just how much she changed! I thought it would be fun to have the kids fill out the interview on the first day of school and then we could compare answers (and handwriting) on the last day of school. I confess…. we are so ready for school to end. I need a break from lunch bags, permission slips and all the drama elementary school can bring and the kids need a chance to unwind, play in the sun and sleep in! I hope you enjoy this little printable and I promise.. very soon you’re busy sharpening a million pencils crayons and trying to figure out what to pack in your little one’s lunch bag. Nows the time to get outside and enjoy the sunshine! This is an awesome printable, The last day of school is always bittersweet, Will be printing this out for use with me kid, My kid love to look back at their school albums. This is adorable! My kid’s Pre-K teacher made each of her students a little time capsule of their year together. This will make a perfect addition! Thank you! This is an awesome printable! So clever and memorable to make! I wish I thought about this during the elementary school years of my kid! Darn! Oh well! School has just starteed in this side of the globe but I will download this as I can use this in March next year for when school ends with my daughter. Love this idea and I’m excited to do it with my kids every year! Thanks for sharing! This is so clever. My daughter closed school on Friday for 3 weeks – think I am going to do this with her today. Thanks for sharing this, I love printables. I dont have kids but this is a cute printable. If I had kids I would document last day of school stuff not just for the kids to reflect on for that year but keepsake memories of that year for them! love this idea for a printable… I’d put it right into my kids baby book for memories to look back on! thanks for this! we are already counting the weeks till school goes back. It is so sad to know summer is almost over for us. 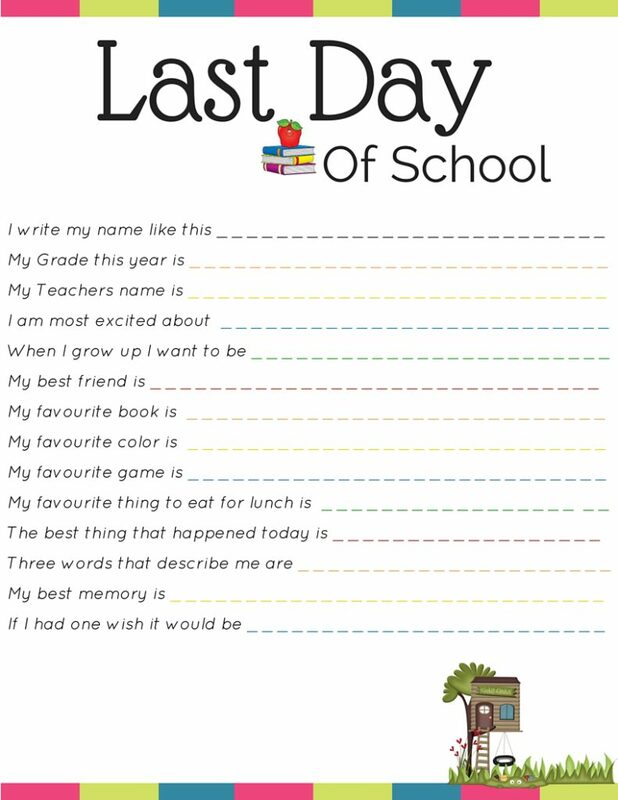 What a cute printable for the last day of school. I will bookmark this for next year. How did the school year go by so fast? Mine is done next week and I can’t even believe it! Enjoy the summer and the extra time together as a family. This is such an adorable printable. It would be nice to get your kid to do something like this at the end of every school year, and make a photo album with them. That way, the kids can reflect on them when they are older. That is such a great printable. I should print one out for both of my girls. I think this would be great to keep together in a book for my girls for when they get older. Love this! I can’t wait to do something like this for my little girl when she’s a little older! – Well maybe I can 😉 Such a great printable! Aww! This is so sweet! My daughter is only 8 months old right now, but I’ll pin this to use it in a few years when she starts pre-school! Oh this is cute I really like this idea. I wish I had done this every year. Oh well, my son just wrapped up elem. school and off to 7th grade we go. I will start now. This is such a great idea – I need to do something like this with my kids. It will be so fun in years to look back at. my little one wont start school for a few years yet but i cant wait to keep track of all of those things. Great printable! This is really cute, and what a great idea for keeping records of your kids and how they grow. I will totally do something like this when I have kids one day. Cute idea! Our kids are home from school and going on week 2. They are bored, and quite frankly getting on my nerves. This is a great idea for capturing small details and memories. My kids love to look back at their school albums. These are so great! I cannot wait till my son is old enough and I do the first and last day of school ones. Got these pinned and hopefully I remember to do them! Haha! Great printable for young children! We just got out of school last week here. Our neighborhood continues our last day of school tradition of blasting the kids with water balloons as they get off the bus! I love the printable! What a nice tradition to begin! Would be fun to see how much and when things change! This is adorable and so meaningful! Will be printing this out for use with me kids – I have a 11 year old and a 4 year old (and a 7 month old baby)! Such an awesome printable. Reminds me of my childhood days. I’m pregnant with my first right now but I want to remember to do things like this when he is older! It would be so fun to see how his answers change over the years. This is a very cool printable! I am glad my daughter gets the Summer off but it is hard to keep her busy sometimes. This will be great! I love the printable! 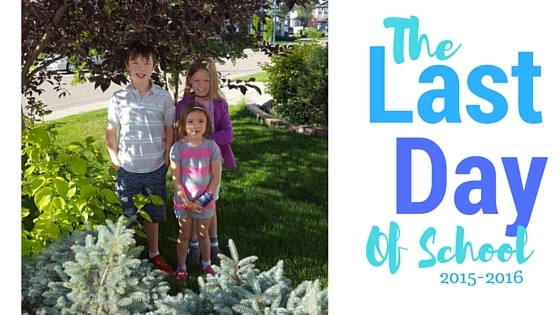 We homeschool, so we finished school at the end of May. It feels so good to be done! I also take pictures at the start and end of the school year and have them draw something up. It’s amazing to see the difference in just 9 months! This is such a good idea. I had a school memory book for my son that had pages like this for each year and it is fun to look back and see what things he liked each year. I love this printable. The last day of school is always bittersweet. This is a great way to help soften the blow and get the kids excited for the future. What a great idea! My son finished school about three weeks ago already I wish I don’t about this earlier I would’ve done this each year that he was in school!